For many people, waking up to the birds is a rewarding start to their day. Observing the activity around their feeding stations while they have their first cup of coffee eases their way into the hectic schedule of daily responsibilities. 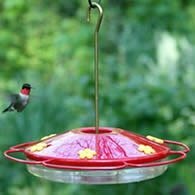 No matter what the backyard size, the landscape can be enhanced to invite your feathered friends closer to entertain, educate and amaze you. First, put out a source of water. Light reflecting off the surface often is the first thing that attracts birds. The sound of dripping water is better yet. 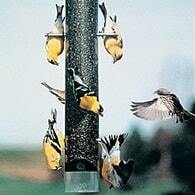 Next, put up several types of feeders. Cardinals, towhees, jays and many sparrows prefer to feed from a place where they can stand. 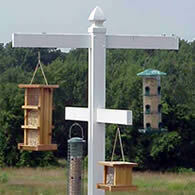 Use a tray feeder or hopper-style feeder with a squirrel baffle. Smaller birds will come to tube feeders with perches. Serve black nyjer seed from a tube with tiny portals to attract the delightful goldfinches. Downy and hairy woodpeckers, as well as chickadees and nuthatches, love suet. Make your own, or purchase prepared cakes that can be used year 'round. Keep feeders, and the ground beneath, clean for the health of the birds. This also will help to discourage nocturnal visitors, including raccoons and opossums. 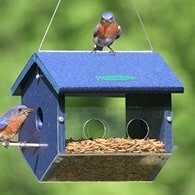 Position your feeders several feet apart to allow enough space for birds to maneuver. Choose areas of the yard that provide optimum viewing for you, but with trees or shrubs nearby for protection and shelter. Put out a few nest boxes (bird houses) to attract wrens, chickadees, nuthatches and titmice. They are cavity nesters, but tree holes can be scarce in urban areas. 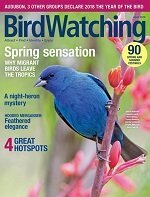 Consider adding nesting shelves to attract birds that don't use birdhouses. Some birds that can be attracted to nesting shelves include: Doves and Robins. Don't forget to add water in winter. 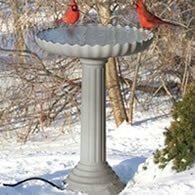 A heated bird bath can draw birds up close during winter.